Why You Should Learn Dart Programming Language? Dart is a brand new programming language and becoming very popular day by day. It is a scalable language that can be used to write simple scripts or full-featured apps. Whether you’re creating a mobile app, web app, command-line script, you can do it with Dart. It’s an easy, productive, fast and portable language that uses a fully object-oriented approach and C-style syntax to make it simple and approachable. print(‘The number is $aNumber.’); // Print to console. var number = 42; // Declare and initialize a variable. Instead of threads, the Dart language uses isolates for concurrency. Isolates can’t actually share any memory, they pass information through messages. With these characteristics, it will now be easier to understand why any ardent programmer should consider learning Dart. Obviously, you don’t want to put your time on a programming language that will take you ages to understand. Here is where Dart will come to your rescue. It has a very short learning curve. You will take a very short time to learn and become an expert in it. But, why does Dart programming look so simple? The first reason is it supports both loose and strong typing. This makes it easier for anyone who is just moving from a different programming language. The Dart syntax is simple and can be easily understood without straining. While the language is well structured just like C, it manages to beat the latter in terms of simplicity. Apart from simplicity, Dart encourages high levels of productivity. Productivity in this context refers to doing more within a short time. This is something that every programmer yearns to achieve. One of the things that make Dart a productive language is its syntax. It has a simple and concise syntax. Not only is the syntax simple but also it is powerful enough to perform complex tasks. Another key factor that makes Dart a productive language is the large collection of libraries that are packaged in it. They will save you from coding every functionality from scratch. Instead, you simply need to call the functions in the library to do complex tasks. Dart programming language is capable of compiling both ahead of time (AOT) and just in time (JIT). Although this feature is not on all the Dart frameworks, you will find it on Flutter (Dart framework for mobile application development). There are numerous advantages that come with these two methods of compiling a program. Ahead of time is ideal for building native mobile apps that will work natively. On the other hand, JIT is mainly used during the development and testing of apps. During the app development process, JIT allows a programmer to see changes instantly. You don’t have to recompile or wait for the mobile app to reload. You will be able to see the changes that you have saved without much hassle. The JIT feature is not available in most mobile app programming languages such as Java and C#. With these two languages, you must save then recompile the app every time that you want to see the changes that you have made. To an ordinary programmer, this can be hectic if not time-wasting. Dart seems to be a perfect solution to this problem. This is another reason why you should learn Dart programming language. It is a very flexible language. This simply means that you can run it anywhere without any limitations. Dart mobile apps can run on Android, iOS, Windows, MacOs and any other operating system out there. 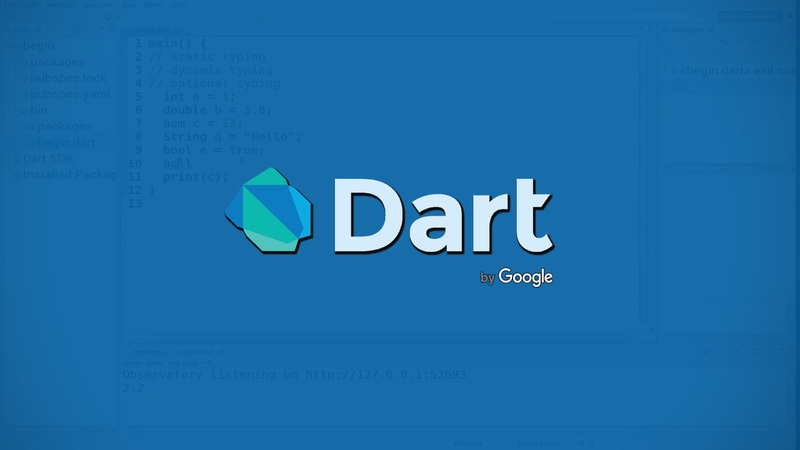 Web applications that have been built by Dart can run on any browser. As a developer, the flexibility and portability of a programming language matters. It is obvious that you would like to build an application that will run on any platform without any constraints. Dart is an ideal language for reactive programming. This is a type of programming that deals with data streams which are responsible for every change in a program. This type of programming can support interactive components of an application such as user interface widgets. The reactive nature of Dart is because of its generational garbage collector and fast object allocation. Also, Dart supports asynchronous programming. This is made possible because of its Stream objects. If you are intending to build a data-intensive or an interactive application, Dart may be an ideal language for you. Dart is a programming language for any programmer. Whether you are a mobile app developer, web developer or desktop application developer, the language will be useful to you. Dart can be used to program both the server-side and client-side of any application. I hope that with this discussion about Dart programming you will be able to ma e a noble and critical decision: to learn Dart programming language. Even if you don’t have an emergency programming project to handle, being an expert in this language will help you be marketable.